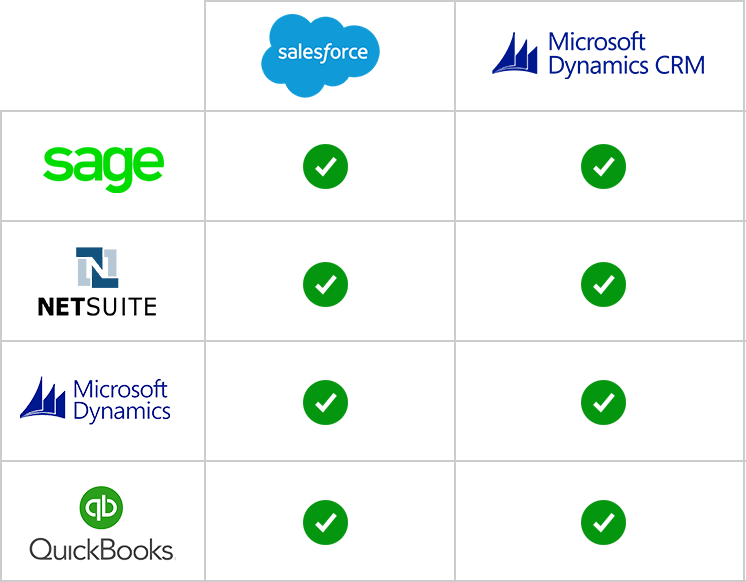 The fastest, simplest and most flexible solutions to your CRM/ERP integration needs. Our integration solutions make it possible to see your ERP data in your CRM. In partnership with Commercient, our sync solution keeps you up-to-date with changes made to your ERP and CRM system simultaneously. Our solutions bring your empty CRM skeleton to life by creating a mirror image of what’s happening in your ERP system. Do you want to connect your ERP system with your CRM? You can integrate your ERP data with your CRM system using our simple one-way sync solution. Integrate your CRM data with your ERP system. Our solution is the easiest application to use to export your CRM data to your ERP system. With the Commercient SYNC Net at Work offers a two-way sync solution designed to integrate both your ERP and CRM data together, creating one master system for easy data access. What Platforms Do We Integrate? Our integration specialists can help! Net at Work is a leading authorized partner and integration specialist of Sage, Salesforce, NetSuite, and Microsoft. Our consultants and developers have extensive integration experience in Accounting, ERP, CRM, eCommerce and all related business management solutions.